When Martin Luther King Jnr. took to the steps of the Lincoln Memorial, the location was well chosen because he stood tall at a symbolic landmark as opposed to preaching in a dingy basement downtown. When you analyse the “I have a dream” speech, it is one of the purest pieces of written text in human history. Seriously, get a transcript and read the whole thing. I do it every year and it’s like a masterclass in writing. What made his dream so powerful though was the vision he implanted in the minds of those who listened. Put simple, he wrote visually. Coming from a filmmaking background it is somewhat natural for me to think in strong visuals, and it certainly helps me when it comes to marketing. As they say, an image speaks a thousand words, and for many people this statement is absolute. A great poster, an intriguing book cover – these are the greatest tools in selling films and books all over the world. 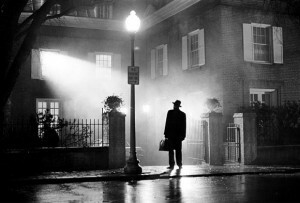 In order to highlight what a great image can do for your project, I’ve taken the image of The Exorcist – not because I’m a great fan of horror, because as a rule, I’m not. However, the amount of information this image reveals about the story is nothing short of extraordinary. Although initially taken in colour, there are no colours that contrast more greatly than black and white. This is symbolic of opposite forces opposing, so it tells us there is a great battle about to commence. 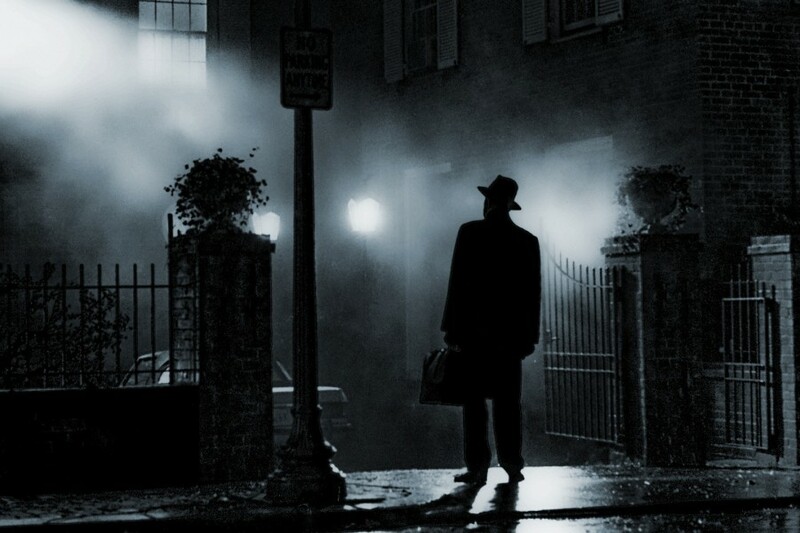 There are two elements that make this mysterious man stand out – his hat and his bag. So who is he? These clues give us a sense that he’s a professional. A doctor? A priest? Whatever he is, he is there for a reason, and the fact he has his bag-in-hand means he is likely to have already been called to action. When you study the way that the man is stood, it’s really quite incredible how revealing it is. He is stood still, indicating a certain level of anxiety, yet he is upright and unflinching, hinting at an inner defiance. I would swear I was looking into this too much if the rest of the image wasn’t so incredibly well constructed. The fact the man is looking up is subtle, but hugely significant. Any filmmaker can tell you this golden rule of framing: when a character looks down at us, they instantly become a commanding presence, but those who look up assume an inferior stance; a position of weakness. How utterly apt for a character about to walk into the dragon’s lair. Again, when the initial colour photographs were taken, you can clearly see a beam of light coming from the upstairs window. When this was edited, this shaft was enhanced to shine prominently on our hero. This does two things incredibly well – it tells us that the force inside of that room possesses overwhelming strength and power, whilst at the same time making it clear the hero is well and truly in the villain’s sights. He’s at the point of no return, and that makes things incredibly exciting. I don’t want to be one of those bloggers who only speaks about success retrospectively because anybody can do that. It’s very easy to point out what worked after the book or film has been released. Also, the notorious success of The Exorcist came down to many factors – great casting, standout performances, great special effects, a shocking storyline that is based on true events (always helps at the box office) and of course the fact it was so controversial at the time. 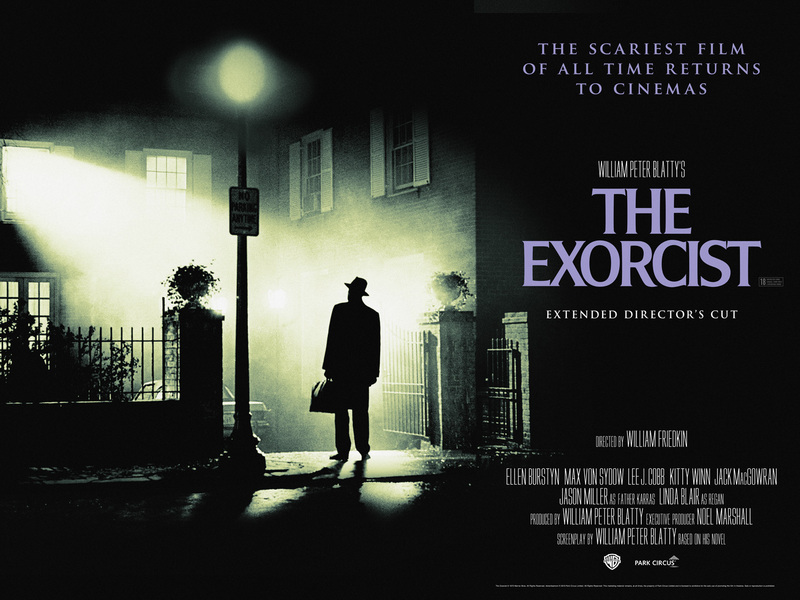 As far as a classic horror film goes, this ticks all the boxes and still stands the test of time today. However, films like this don’t succeed by accident. They do so because every single detail is thought of and approached in a fresh, creatively accessible way, and when you look at the publicity image again, is it any wonder it became so iconic? 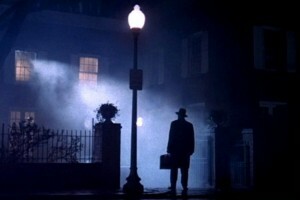 The image is taken in colour, with an emphasis on the light shaft coming out of the window. The image is taken from many varying distances. After all, when all the elements are in place it makes sense to take too many images as opposed to not enough. Somewhere within the reel will be that one perfect shot that will help sell your project. Finally, the image is distorted to emphasise the points you need it to make, and any text such as the project title, tag-line and author’s name can be added so that the entire project can be summed up within a single image. For any writers out there believing that creating images is the job of a photographer, I strongly disagree. Yes, they will have the skills to realise your vision, but if there is anybody in the world who should be able to crystalise your book or film within a single image, it’s you. My advice is that all the way through the writing process, you should be noting down ideas for great images that will help sell your writing visually.